Heat pipe turnkey manufacturing can be a complicated process, but it is the key to many thermal management solutions. Here are four design considerations to keep in mind for aluminum heat pipe design and technology. The length and diameter of a heat pipe is one of the most important factors in thermal management performance. A heat pipe’s size determines how effectively it can cool a desired area by moving vapor from one end to the other. Generally, a shorter heat pipe with a larger diameter is more effective than a longer heat pipe with a smaller diameter. Custom heat pipe manufacturers must sometimes flatten or bend a heat pipe to fit certain design constraints. Flattening a heat pipe saves space, but limits vapor movement. Manufacturers can compensate for the loss by altering the length or wick structure. When bending a heat pipe, the bend radius must be at least three times the diameter to prevent bottlenecking. Gravity also plays a significant role in the effectiveness of aluminum heat pipes. A heat pipe design should work with gravity whenever possible by placing the heated evaporator section below the cooler condenser section. When it is necessary to work against gravity for a particular design, the size of the heat pipe must be altered to compensate for lost performance. The wick of a heat pipe transports liquid from the condenser to the evaporator. For maximum performance, the wick should be fully saturated, but not dripping, to allow for proper freeze-thaw cycles without heat pipe deformation. Designers should choose wick structure based on the necessary temperature range of the heat pipe. Getec Industrial has over 30 years of experience as an aluminum heat-pipe cooling solutions manufacturer. 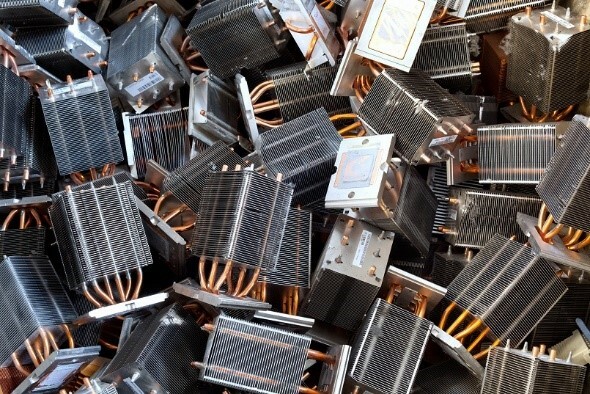 For more information about our heat pipe heatsink aluminum services, contact us online or call us at 888-999-8499.